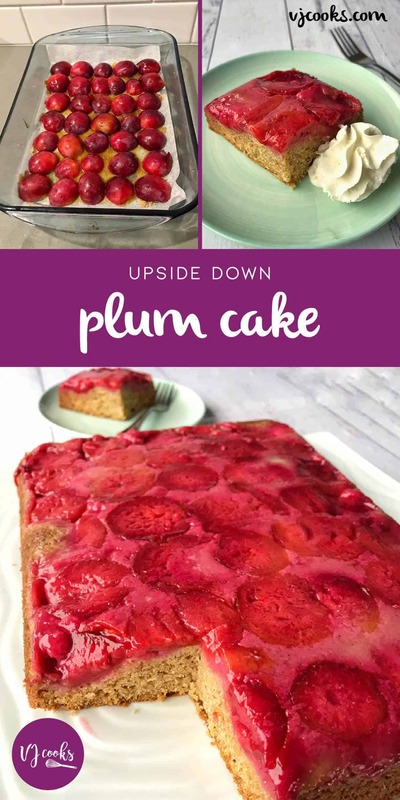 I was given a bag of fresh plums by a friend and wanted to create a delicious cake that would feed a crowd. 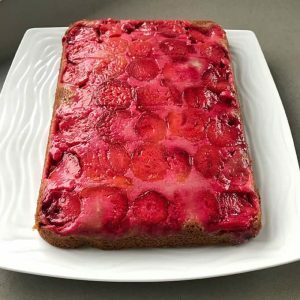 My plum cake was made in a rectangle oven dish so that the cake part wasn’t too thick. You can also make this in a round tin but you may have to adjust the cooking time. The cake batter in this recipe is spiced with cinnamon, nutmeg and allspice. This combination goes so well along with the tart plums. To start off this recipe I lined a cake tray with baking paper. Then I brushed over melted butter and scattered in brown sugar, this created a sweet topping with the cooked plums. 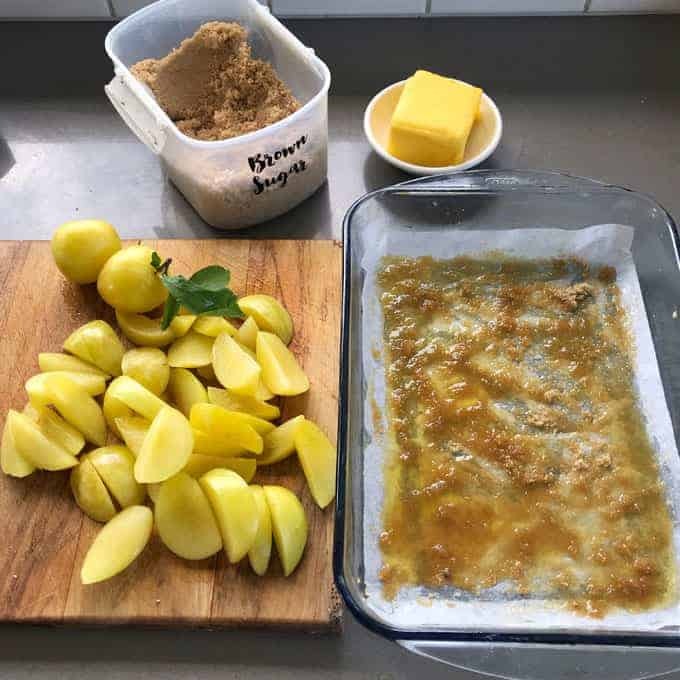 Once the brown sugar and butter mix is in the bottom of the tray I layered over the fresh plums, you can cut them into halves or wedges depending on the size of the plums. 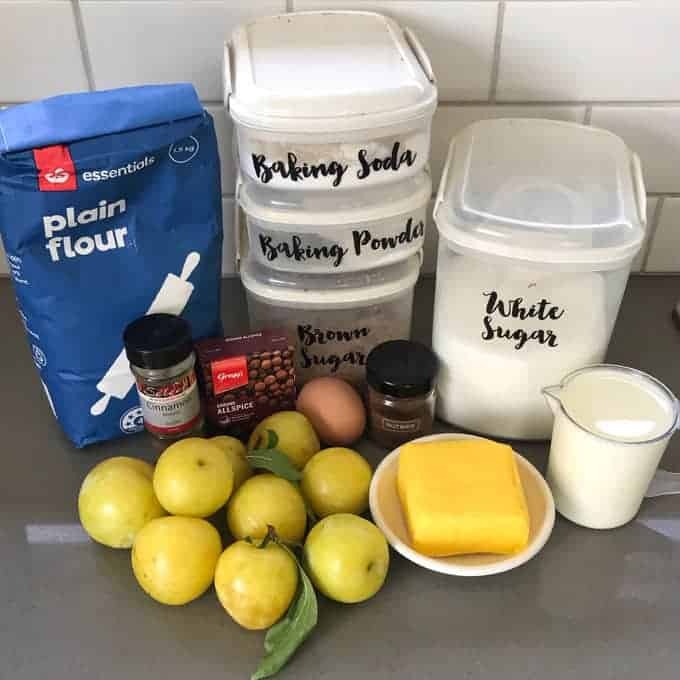 I have tired this cake recipe with both red and yellow plums, I can’t wait to make it with Black Doris plums but they aren’t quite in season in New Zealand yet. 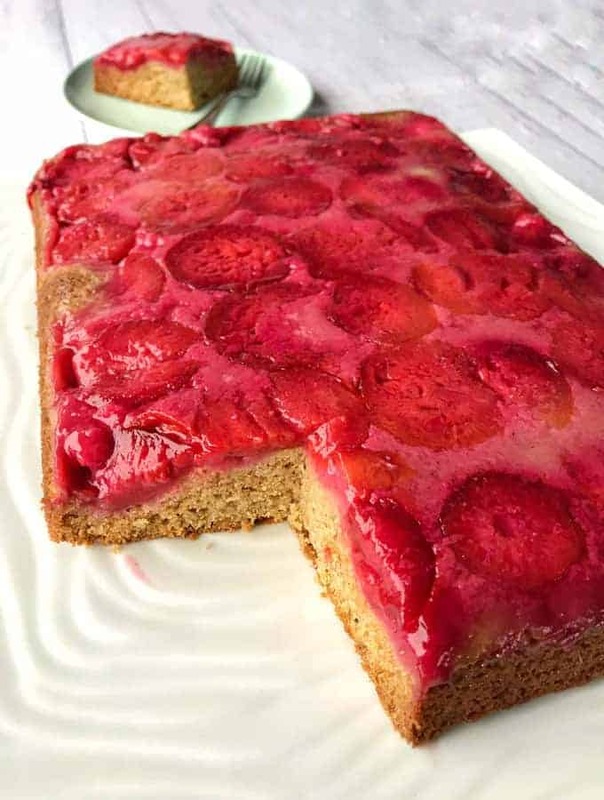 After you have layered in the plums you pour over the cake batter. 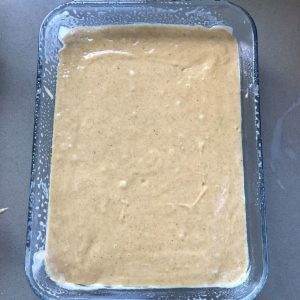 The batter is so quick to make with no beating required just a melt and mix together method. 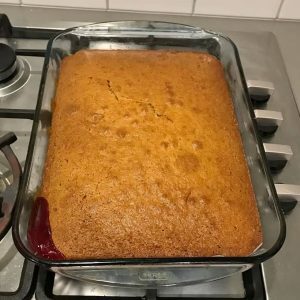 Once the cake is cooked let it cool in the tray then turn it out onto a cake plate and carefully pull off the baking paper. 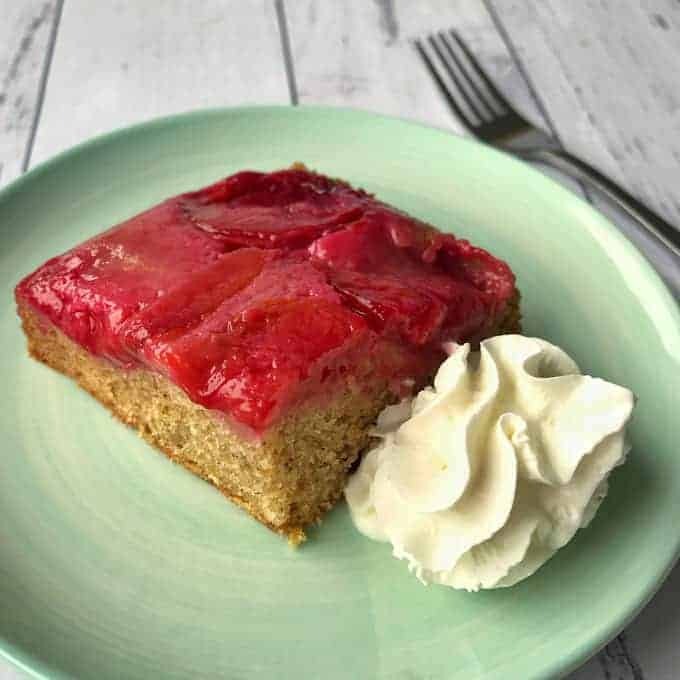 I like to serve my plum cake with whipped cream or greek yoghurt. For a dessert idea you can serve squares of the cake warm, dusted in icing sugar with a scoop of vanilla ice-cream, delicious! Which colour plums to you prefer the look of yellow or red? I think they both look pretty amazing. 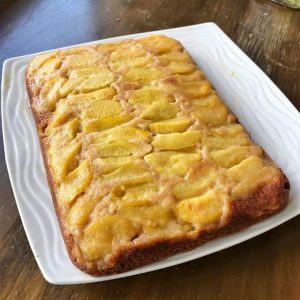 This recipe would work so well with other stonefruit: apricots, nectarines, peaches or even pears. Pour melted butter into the base of the cake tin then brush to the edges, scatter over brown sugar in a thin layer. 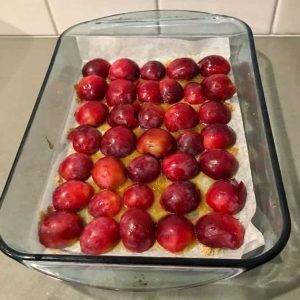 Cut plums into 1cm thick wedges then layer them all on top of the butter and brown sugar until the whole base is covered. 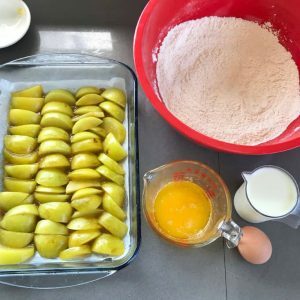 In a large bowl sift or whisk together the dry ingredients, make a well in the centre and pour in the melted butter, milk and crack in the egg. Fold all together until combined and pour the mixture over the plums. Let cool 10 minutes, then invert cake onto wire rack to cool again slightly before serving. Serve with a dallop of yoghurt, whipped cream or warm with ice cream as a dessert. 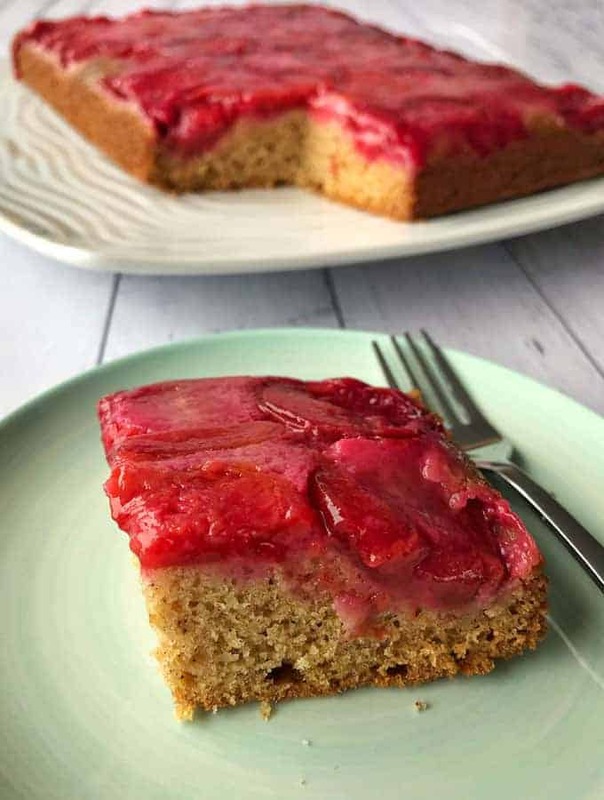 This recipe would work with most types of stone fruit or even canned pear quarters.